More and more appartment blocks provide hot water from one central location and then distribute it around the building. Within each appartment there is a Heat Interface Unit (HIU) which controls and measures the hot water. Many HIUs come with a warranty which is dependant upon an annual inspection. AM Dalton Plumbing will come and conduct that inspection. Many new appartment blocks make provision for hot water in one central location and then distribute the hot water around the building. Within each appartment there is a Heat Interface Unit (HIU) which controls and measures the hot water into the appartment. So, if you have a boiler room or a plant room somewhere in the building then you are most likely on some sort of communal system. Many HIUs come with a warranty which is dependant upon an annual inspection. AM Dalton Plumbing will come and conduct that inspection. Hot water is supplied from one central location and then distributed around the building. A Heat Interface Unit (HIU) within each appartment controls and measures the supply of the hot water. 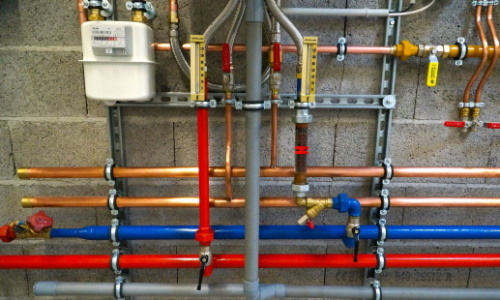 AM Dalton Plumbing will carry out any work in an efficient and compliant manner. Our experienced and appropriately qualified personnel will conduct the work to your satisfaction. AM Dalton Plumbing will offer a discount.